The hottest revolution and bestselling video game in the music game category continues its long tradition of innovation and creativity with an entirely new game for the next-generation! 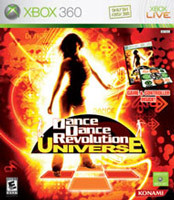 Dance Dance Revolution UNIVERSE, exclusively designed for the Xbox 360, takes dancing to a whole new dance floor - offering features and options not possible until now. Dance Dance Revolution UNIVERSE is designed to be a "universal" DDR - a game that everyone can play and enjoy, including anyone with two left feet.